Publisher's description: The body of a girl washes up on a mud bank along the edge of the River Medway amid a litter of poisoned fish and sea birds, casting an accusing shadow upon the deadly secrets of the Majestic Paper Mill and its wealthy owners. Simple answers to the mystery begin to suggest insidious secrets, and very quickly Langdon St. Ives and his wife Alice are drawn into a web of conspiracies involving murder, a suspicious suicide, and ritual sacrifice at a lonely and ancient cluster of standing stones. 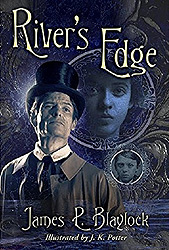 Abruptly St. Ives's life is complicated beyond the edge of human reason, and he finds himself battling to save Alice's life and the ruination of his friends, each step forward leading him further into the entanglement, a dark labyrinth from which there is no apparent exit.